Northern Ireland's Olivia Mehaffey during the final round of the Augusta National Women's Amateur in Georgia. Photo by Kevin C. Cox/Getty Images. One of 30 players to reach the final round of the inaugural Augusta National Women’s Amateur, Mehaffey finished the 54-hole tournament 15 shots behind winner Jennifer Kupcho. “It’s been so special, we’ve been treated so well so far and the golf course is so beautiful,” said Mehaffey on an Augusta National Women’s Association social media interview. “You just feel so grateful to be here and be part of this historic event. “This week is so historic for so many reasons. “Female sport right now is really on the up and so much more media coverage, it’s getting the attention it really deserves. “It’s so special to be part of an event like this, the pros are watching and everyone is watching globally. “Being here and a part of it is so special so I’m really grateful for that. “It was so exciting (getting the invite), only 72 people get this opportunity to be here. Kupcho completed a wire-to-wire victory at the Augusta National Women’s Amateur tournament, courtesy of a remarkable back-nine rally. World number one Kupcho finished four strokes clear of nearest challenger Maria Fassi after picking up five shots in the last six holes of her final-round 67 at Augusta National Golf Club, which will next play host to the Masters. Saturday’s final round saw women compete in a tournament at Augusta for the very first time, with the first two rounds being held at Champions Retreat Golf Club. American Kupcho began the day with a one-shot lead but found herself two shots behind Fassi after carding one birdie and one bogey in her first 12 holes at Augusta. 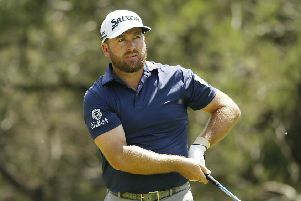 Kupcho joined Fassi on seven under par after an eagle at the 13th before reeling off birdies at the 15th, 16th and 18th to jump to 10 under and clinch the title.